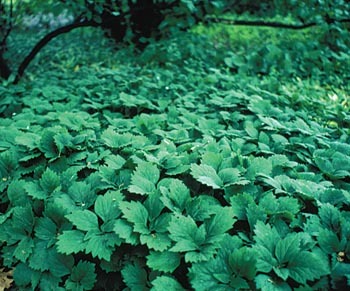 Reliable, sturdy, clump forming,dense groundcover. Grows 6–12 inches tall and spreads to 4 feet across. Differs from Japanese pachysandra in that the foliage is larger and bronze green that takes on red hues in the fall. Prefers light to dense shade. Space 8–12 inches apart. Perennial. Hardy in Zone 4.